Calamity turns into convenience, but at what cost? Klassen's latest Regency romance novel is laced with deception and love. Hannah Rogers returns to her previous employers—Sir John and his promiscuous wife, Lady Marianna Mayfield—in the hope of receiving her final payment. Hastily leaving them after discovering that she was with child, Hannah is in desperate financial straits since she does not have the necessary funds to rescue her baby from a corrupt maternity home. The visit to the Mayfield estate is not what Hannah expects. Marianna tells Hannah that she will receive payment after she accompanies them to their new home. In the midst of a terrible storm en route, their carriage goes off a cliff. Hannah awakens to find herself not only in unfamiliar surroundings, but also among strangers who insist on calling her Lady Mayfield. Over time, Hannah learns that she is one of two survivors. The other is Sir John, who is comatose. Seizing upon a serendipitous situation, Hannah uses her new persona for the sole purpose of retrieving her son. Hannah also needs time for her arm to heal before leaving to find employment. Apparently no one is around to recognize her true identity. But that is about to change and unsettledness takes over big time when various people enter Hannah's life, followed by a slew of bizarre circumstances. And with no one else to turn to, Hannah has no choice but to remain steadfast in her faith during times of uncertainty. Well researched—even to the point of visiting the specific UK area, Klassen's third person narrative is a wonderful combination of history with a hint of Jane Eyre. Klassen's attention to detail accurately captures a time period when women sought out ways to be valued amid exploitation while living in a power-driven and staunchly patriarchal society. But readers with a fetish for Regency romance novels will be quick to identify a Jane Eyre-Mr. Rochester feel as Klassen's plot unfolds. While Klassen clearly admits to the Brontë inclusion, her novel is definitely a standalone and bears no resemblance to the British classic. Klassen's highly developed and largely foiled cast is a balanced mix of congenial and not so congenial servants, proud businessmen, lowlives, and everything in-between that brings out the worst and the best out of Hannah. Of course, a romance novel wouldn't be complete without its suitors, and Klassen makes sure to surround Hannah with a small but very carefully designed selection of men—all of whom she feels passionate about, but leaves readers wondering who the winner will be until the very end. Constantly alternating between the present, backstories, and character scenes, Klassen slowly but definitively folds in a flurry of drama, mystery, romance, as well as throws in a healthy dose of comedy while sprinkling Christian virtues within tension-filled environs. Klassen deserves much kudos for creating a delightfully spellbinding story, one that unquestionably should be read more than once. 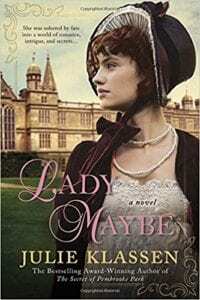 Quill says: Lady Maybe is one compelling read that is not only earmarked to be an award-winning book, but also a beloved classic!